The Graduate School has been systematically working on two doctoral completion projects. In August 2004 the Graduate Schools at the University of Georgia, University of Florida, and North Carolina State University began working on a 3-year collaborative project to improve doctoral completion. This project included several research projects, data analysis, conferences, and research briefs. The project was funded by the Council of Graduate Schools. This project is no longer active, but many valuable resources can be accessed on this site. 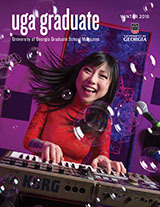 In January 2008 the Graduate School at the University of Georgia launched the Initiative for Optimal Doctoral Completion also funded by the Council of Graduate Schools as part of a continuation project. The intent of the Initiative is to implement our findings from our previous studies to all doctoral programs at UGA.